October marked the first anniversary of the coral restoration program at Six Senses Zil Pasyon and the beginning of the next exciting chapter in the project, which aims to restore a seafloor area of about 6,500 square feet (600 square meters). 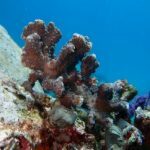 During the one-year period, corals grew over 200 percent on average, with a growth range of between 85 and 422 percent per harvested segment. Survival rate was 93.4 percent, with the majority of the loss resulting from nursery damage that unfortunately took place during August’s rough monsoon season. Seychelles and the Indian Ocean have been particularly vulnerable to coral decline due to a range of stresses, such as climate change, fishing, coastal development and natural predation, but these organisms provide essential ecosystem functions as well as tourism value. Six Senses Zil Pasyon had a unique opportunity to restore the coral surrounding Félicité, and while the main focus of the program was directed at conservation, it also provided an opportunity to educate guests and the local community. Following a feasibility study in July 2017, 1,800 coral fragments were harvested. 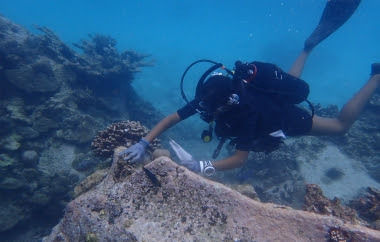 Suitable fragments were identified by qualified marine biologists, including Zora, from the various partner organizations. Donor corals were chosen from colonies from neighboring Albatros Island, known to be vulnerable to sea snail infestation yet having simultaneously proven their strength and heat-resistance by surviving the 2016 mass bleaching event in the Indian Ocean. The nursery, which allowed the corals to grow for one year, was constructed with ropes and pipes for buoyancy and resembled an underwater hammock about 65 by 20 feet (20 by 6 meters).